Recent political events in Venezuela have once again brought to the fore its devastating economic situation. The struggle for power between Maduro and Guaidò, or between a fraudulently re-elected president and an opposition candidate who has proclaimed himself president, besides giving Venezuela a grotesque image, hides the real scenario of an economic and political human tragedy. A partial but clear investigation reveals three things. The first is that in this political affair involving the government of Caracas and its opposition, US interference is not far away. For Trump’s agenda, the Venezuelan crisis is the key to the US’ re-entry into South America, which, for too many years has been out of Washington’s control and where the current crisis, if well exploited, could recreate all the conditions for the continent’s economic and political subjection to American imperialism. Guaidò has not only received the support and financial help of Trump, but if things should lead to civil war, the self-proclaimed president will receive weapons and political support that would make Venezuela the central pivot of the “Yankee reconquest" of everywhere in South America, including Brazil. The second takes us to the root cause of this whole situation of dangerous turmoil, which is taking place not so much in the lobbies of the central government in Caracas, as in the streets of the capital and the centres of greatest economic importance. In short this is the crisis that has literally devastated what, in the Bolivarian fantasies of, first Chavez and then Maduro, was supposed to be the "new" socialism that would have solved the problems of chronic poverty and never ending exploitation. It arose as a beacon of emancipation for the Venezuelan proletariat thanks to rising oil revenues. However ten years of crisis have torn the veil off the false illusions that the Chavistas have nurtured within the Venezuelan population, by investing some crumbs of the oil revenues in low-cost welfare operations, with the sole purpose of maintaining a solid electoral base and a political consensus in their favour. At the end of 2018 inflation reached 1 million per cent making wages practically worthless. A worker’s wage can buy two dozen eggs or a simple hamburger (according to Caritas International). In 5 years GDP has fallen from $480 to $93 billion, demonstrating that, outside of oil revenues, the two Bolivarian governments have not thought to create new infrastructures, or to reinvest in sectors such as agriculture and light industry. After the price of crude collapsed in 2014, it was all over, and even the capacity for oil extraction has halved. In 2015 oil production was 2.4 million barrels per day, but by 2018 it had fallen to 1.4. 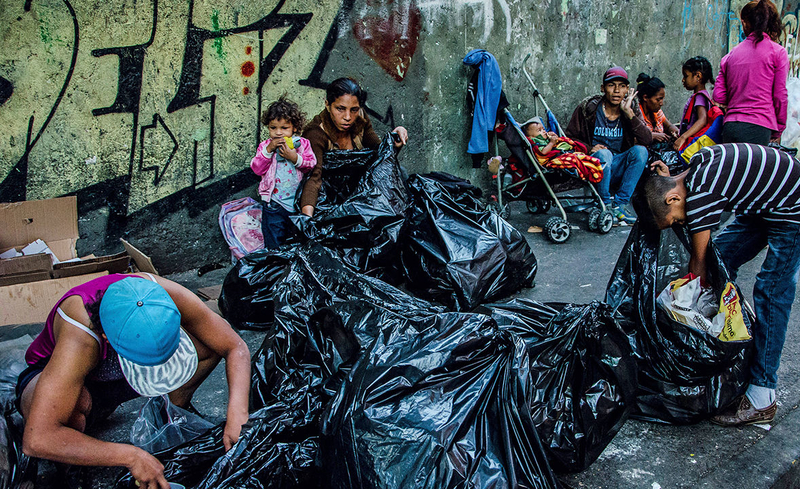 As a result, the population found itself overwhelmed by inflation, on starvation wages, so much so that according to IMF statistics, 91% of Venezuelans now live below the poverty line. Unemployment is officially at 34%, but in reality there are not enough data to quantify the phenomenon. With an average salary, for those who have it, of 5 million and 200 thousand bolivares (which at the current exchange rate are worth a $1.30) they eat once a day hoping they can make it to the next. The third consideration concerns the colossal lie known as the “Bolivarian road to socialism”. Despite the fact that the crisis has done its bit in terms of economic devastation, and that the Trump government has done even more to undermine Venezuela, the fact remains that from Chavez to Maduro, in perfect continuity, the ruling class has only thought to make the most of the lottery of lucrative oil revenues, without thinking seriously about the pockets of poverty and unemployment that the crisis has now only highlighted even more. The ruling class doled out a few crumbs of this great wealth very sparingly, in order to secure an electoral base that would allow it to continue to dominate a state capitalism based on rich oil revenues that pretended to be socialism. The stand-off between Maduro and Guaidò is not a clash between a socialist society in trouble and a capitalist reaction trying to grab power. It is only a very heavy tension with violent clashes in the streets between protesters and police, a sort of latent civil war between those who have benefited until now from the benefits of a high oil revenue, from exporting financial capital to tax havens, from playing speculatively on international markets without thinking at all about productively investing at home, and those who, exploiting the current economic crisis and the resulting popular discontent, aim to replace it, with the same arrogant cynicism, as the power brokers. And as always they call on the devastated Venezuelan proletariat, in the name of a fake socialism and a false democracy, both equally politically bankrupt, both based on the same economic and financial parasitic speculation, to fight a war that, whichever way you look at it, has nothing to do with its class interests. Even if the great imperialist powers are not themselves considering playing the Venezuelan game, its oil and its strategic weight in the South American chessboard, are reasons enough to produce yet another massacre like Syria, but with even more tragically serious international repercussions. The lines are already drawn up. On the one hand we have Russia, China and Turkey, and on the other the US, Canada and most of Europe, each with the support of South American countries which hope to obtain economic or even just political advantages from supporting one alliance rather than another. As yet there is no proletarian response. This has to be rebuilt, by drawing it away from false promises of both sides and linking it to an internationalist strategy, expressed by an international party that is able to show the world's proletariat the only possible path, that of revolution against the capitalist system in whatever disguise it takes on. What does this mean. "Even if the great imperialist powers are not themselves considering playing the Venezuelan game,"
Does it mean they are not going into Venezuela, just supporting one side or another? Or something else? I had comparable difficulties translating of this sentence into Dutch, both from the Italian original, as from the English translation. However, the author doesn't make the prediction Stevein is asking. As I understand the situation, the great powers hesitate to intervene directly (as they have done in Syria), and may prefer - for the moment - to support a proxy-intervention, but a direct intervention by the superpowers is not excluded, seen the importance of the region. Nuevo Curso ¿En qué acabará la crisis Venezolana?. Unfortunately I hardly understand anything of these two articles because my poor knowledge of spanish and automatic translations give puzzling results. But I believe that these texts go deeper into Steveins question. Agree with Fredo re his interpretation of FD's intent in the sentence under question. Ironically Stevein is almost bilingual in Spanish and English so can read the articles you mention. Nothing wrong with them except perhaps a tendency to see a greater role for Bolsonaro in this crisis than we can find evidence for and also a suggestion that war in Latin America is closer than we think (but who knows given the state of the insoluble global economic crisis?). Eventually also Nuevo Curso's today's article. If leftcom.org cannot publish these translations, libcom.org would be a possibility. Even better would be a discussion on these different approaches of an urgent problem by groups that all refer to the Communist Left, and that all proclaim to work for the resurgence of the communist party. Therefore: could and would Stevein translate these texts?